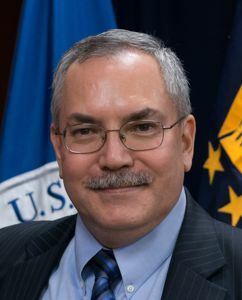 Bob Jensen brings more than 35 years of experience across a broad spectrum of assignments both inside and outside of the U.S. government, most recently as the Principal Deputy Assistant Secretary for Public Affairs for the U.S. Department of Homeland Security. He ensured U.S. government communication efforts had the effect and outcomes needed to save lives, maintain public confidence and address complex international situations. He also provided oversight and input to risk assessments and strategy development for U.S. national security issues including cybersecurity, natural disasters, pandemics, counter-proliferation and counterterrorism. He led the U.S. government’s on the ground crisis communications efforts after the massive earthquake in Haiti, for the Deepwater Horizon oil spill response and for more than 30 major disasters in the U.S. including Hurricane Sandy for FEMA. Leading deployed teams of up to 2500, Bob found solutions to challenges that included working in dangerous environments, overcoming cultural and linguistic barriers and quickly reaching a large set of diverse audiences at the local, national and international levels. Bob served as a spokesman for the White House’s National Security Council as well as for the U.S. Embassy in Baghdad. He led the Combined Forces Air Component’s media operations at the start of Operation Iraqi Freedom and led on the ground efforts to assess and improve coalition strategic communication effectiveness in Iraq and Afghanistan during four combat zone deployments. Other positions included Deputy Director of External Affairs for the Federal Emergency Management Agency; Director of Communication Operations for Iraq and Afghanistan within the Office of the Assistant Secretary of Defense for Public Affairs and Director of News Operations for the Air Force News Agency. He is a graduate of Air War College and has a Bachelor of Science in Industrial Design from Ohio State University. He has been an international keynote speaker at conferences in Australia, New Zealand and Canada and is a frequent speaker at conferences in the U.S. A Fulbright Program alumni and the first international fellow of the Australian organization Emergency Media and Public Affairs, he is also a member of the International Advisory Committee for the Centre for Disaster Management and Public Safety at the University of Melbourne; an Honorary Fellow for the Centre for Emergency and Disaster Management at the Queensland University of Technology in Brisbane, Australia; an Associate Member of the Interoperability in Extreme Events Research Group, University of Sydney; an Honorary Member of the Risk Management Institution of Australasia; a Member of the Board of Directors for the George C. Marshall International Center and a frequent guest lecturer at the U.S. Defense Information School and universities around the world. He is a recipient of the Secretary of Homeland Security Gold Distinguished Service Medal. He consults with national and state governments as well as major corporations globally.